In brief, you should know the following about us: our company was established in 2005 and have been responsible for providing outstanding casino party services ever since. Our specialty is in the area of Fundraisers. Our regular customers particularly value that we attend committee meetings of nonprofits to discuss a casino party as a fundraising option. We provide casino party services at your home or business event. You need entertainment we provide the services. Tables, Chips, Cards, Playing Equipment, and Dealers for 3 hours is all included. We are local to Chico CA and our coverage area is Butte County and surrounding areas. 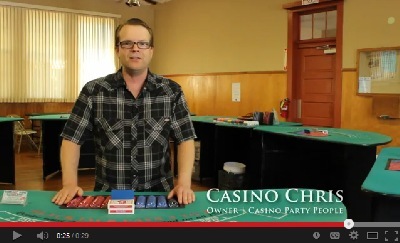 Casino Party People provide a realistic entertaining casino like experience. Our goal is to mimic a casino in such a way that people who attend the party believe they are at a real casino. Because these parties are for entertainment only, there is no risk of losing money. So people who are trying new games or have no gaming experience, have nothing to lose and no money at risk. This also provides partygoers to have an experience they will never forget. Having a entertaining party is a fun and exciting experience. At the end of the party we pack our equipment and leave the party areas as we found them. Click on the "Party Quote" link to request a quote for your party. Let us provide the entertainment and your guests will thank you. You can reach us at 530-774-4648 .We are looking forward to hearing from you. You can also contact us using our web form on the party quote page.